Senneferi was the chancellor of the king in Thebes (modern Luxor) in the reign of Thutmose III (c. 1430 BC). His large but badly damaged tomb lies in the hill of Sheikh Abdel Qurna on the West Bank at Luxor. This first of two volumes focuses on the use of the tomb complex during the New Kingdom, especially the 18th dynasty (c. 1550–1300 BC). It begins with an account of Senneferi himself, looking at his career, his family and other monuments made in his name as far apart as Gebel Silsila in southern Egypt and the Sinai peninsula. The central section deals with the development of the layout of the tomb during this period and its recent exploration, including a detailed reconstruction of its history from 1430 BC to the 20th century AD. The remaining chapters detail the decoration and finds from the excavations, including a painted statue of Senneferi’s son-in-law and a unique set of implements from the Opening of the Mouth ritual, as well as possibly the largest ceramic assemblage yet known in a tomb of this date. This book presents the results of the detailed analysis of what at first sight appear to be unpromising finds and reveals new insights into burial practices at the height of the 18th dynasty. 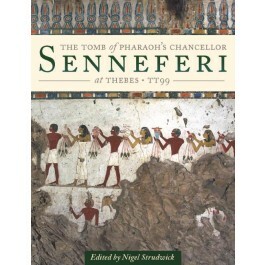 "[The Tomb of Senneferi] proves what it is possible to gain from even the most damaged remains. The book contains a wealth of important and well-presented information and will be useful for anyone with a special interest in Theban tombs."